Review: The first thing I have to say about this book is the fact that the cover is absolutely spectacular, and to be honest it is the main reason that I bought this book in the first place (the other reason being that one version was actually published on my birthday- a perfectly sound reason to buy a book right?). Therefore it probably won’t surprise you that I had absolutely no idea what this book was about going into it. I’ve seen a few of reviews on Goodreads describing this book as ‘boring’, ‘predictable’ etc. though you might have guessed from that 4.5 star rating that those aren’t the words that I’ll be describing this book with. In a way I can see where the ‘predictable’ is coming from, there were some aspects at the beginning of the book that were slightly obvious as to where they were going to go, but the book wasn’t without twists and turns. Addressing that ‘boring’ note that some reviewers have made, I didn’t ever really find large parts of the book to be boring. There were a few chapters that lacked action or were slower than other parts, but usually they were followed with enough action to make up for it. So for me, I found the pacing quite good. Character-wise, I liked the main character, Aria- I liked that she had this doubt inside her head as to whether everyone was lying to her or not, but the best thing was that it grew over time- she wasn’t completely sure of it from the moment the book started. I also really liked both Hunter and Thomas, though for different reasons. Another thing I enjoyed was the fact that although Hunter was the ‘rebel mystic’, he wasn’t really a bad boy and neither was Thomas- a refreshing little aspect there. Plot-wise, I enjoyed it. It definitely had parallels with other young adult novels, but I mean how many books do you find nowadays that don’t? I liked how the smaller characters and all the details of Aria’s world all connected together with the plot. And finally, the world. Probably one of my favourite things about this book overall. I liked the descriptions and the details and the contrast to our world both in Aria’s glamourous lifestyle and Hunter’s not so glamourous one. Another thing I really enjoyed were the ‘mystics’, I really enjoyed learning about them and seeing all of them through the innocent eyes of Aria. 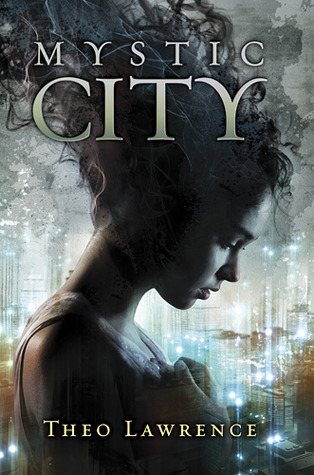 So needless to say, I really enjoyed Mystic City and words could not even begin to explain how excited I am about the second book!